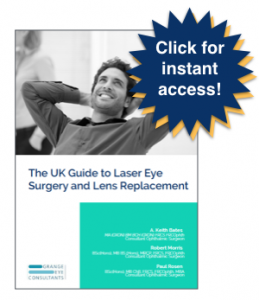 How long do lens replacement surgery results last? Lens replacement surgery results have a permanent effect. So, if a patient has a long-sighted or a short-sighted prescription, or astigmatism or presbyopia, the effects of surgery will be permanent. Reasons why results may change as one ages. It’s important, however, to remember that if you are operating on somebody who’s 50, there are other changes that can occur with the eye. So, the shape of the eye may alter, and it may be that over a 5, 10 or 15-year period, a patient may develop some astigmatism at a later stage after surgery. As we get older, our vision isn’t as good. So, if we have really successful surgery at the age of 55, at the age of 85, we’re not going to be seeing as well. In the same way that we don’t hear as well when we’re 85 as we do when we’re 55. So, the effect of surgery is permanent in that sense, but it doesn’t mean that the vision is going to be as good as it is at six months forever. The risk of secondary, or after cataract. Another important consideration with lens replacement surgery is that patients may develop what’s known as a secondary, or after cataract. So, lens replacement surgery is essentially cataract surgery, so one leaves the skin of the lens of the eye behind. The analogy being that the lens of the eye is like a plum, it has a skin, a flesh, and a stone. You take a small disc of the skin on the surface of the plum away, or the lens away, and take out the flesh and the stone and put the new lens in that. The back surface of that skin may thicken and wrinkle, and that will make the vision become blurry. Very simple matter to deal with, a painless outpatient procedure taking 3 or 4 minutes. But if it does occur, it does drop the vision. But it’s easily solved and addressed. Lens replacement surgery is permanent, but the vision that you obtain after lens replacement surgery won’t be the same forever, because of other changes that may affect your eye.